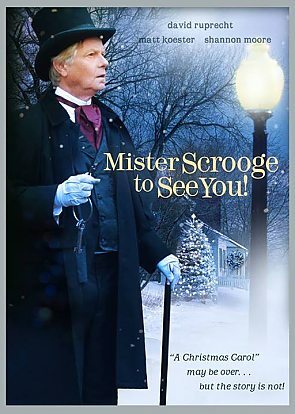 Thoughts: This is by no means the first time someone has attempted a sequel to A Christmas Carol. There have been versions that show Tiny Tim as an adult, Marley getting redeemed himself, and all manner of stories featuring the older versions of these characters. This one is a cute enough film, if obviously made on a low budget. The greenscreen effect use to insert Marley into the shots is crude, the footage looks cheap (although that’s probably an ironic effect of using digital video rather than actual film), and the performances are straight from an amateur production of… well… A Christmas Carol. Of the cast, David Ruprecht’s Scrooge is the best performance. In one scene he pulls off a fake-out on Bob Cratchit before making him a full partner in the firm of “Scrooge and Cratchit,” and he’s pretty convincing both as the nasty miser he used to be and as the cheerful soul he’s become. Ken T. Williams’s Bob Cratchit isn’t bad either – still a bit downtrodden, but a man who has happiness in his heart. It really shows in that same scene, when he gives Scrooge a gift of the original Tiny Tim’s no-longer-needed crutch. Belle (Belle Dickenson – aaaah? Get it?) is in trouble, but Tim’s soul is in far worse shape. He’s greedy, nasty, and frequently spouts slightly-altered versions of Scrooge’s classic pre-redemption lines. He comes across here even more actively malevolent than Scrooge usually does in the traditional versions of the story. Scrooge is mysteriously transported to the present day, where he meets up with Belle and learns how Tim is planning to shut down her company. Unfortunately for Tim, Scrooge still has the paperwork marking him as a partner in Scrooge and Cratchit Financial, and uses it to block Tim. He begins to turn the company around, driving Tim crazy while making everybody else in town merry as can be. Once we hit this mark, where Scrooge starts driving Tim insane, the film actually gets entertaining. There are some great comedy beats where he’s integrating himself into modern society, and a few fine mirrors of his own time while Tim gripes and complains about all Scrooge’s efforts to bring Christmas down upon him. The movie ends with a surprising twist – surprising in the sense of “utterly ridiculous and impossible to believe.” On the other hand, it does prevent the movie from having the same ending as 90 percent of these movies do, so I’ve got to appreciate it for that if nothing else. The story actually isn’t bad – it’s at least as good as the endless carbon copy made-for-TV movies that turn up on the Hallmark Channel this time of year. It would be nice to see what would happen if someone with a budget got their hands on this script. This is pleasant as a diversion, but a talented filmmaker could probably make something really memorable out of it.